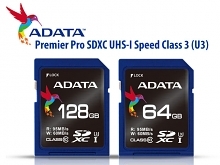 The Premier Pro series of SDXC UHS-I Speed Class 3 (U3) high-speed memory cards delivers enhanced performance with read/write speeds up to 95/60 MB/s, fully supports the latest 4K2K photographic device, and enables professional grade ultra-fine high-quality images to be captured. 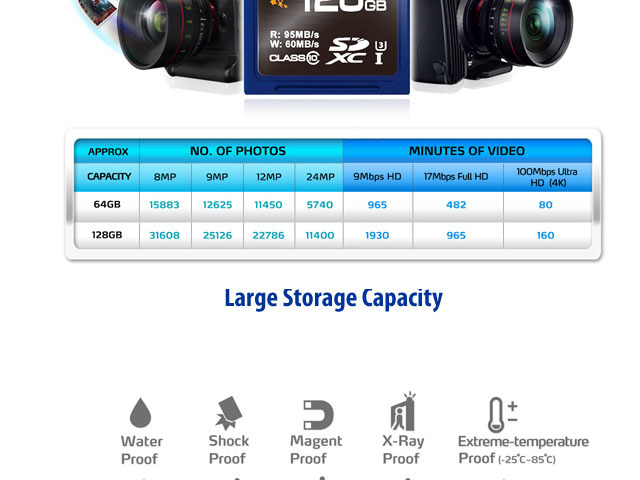 With smooth transfering speed of large files, Premier Pro memory cards allows users to fully utilize the power of burst mode photography. 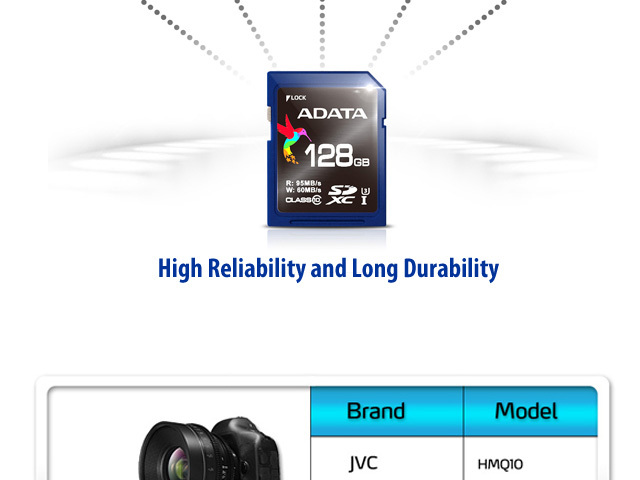 The high performance, reliability, and durability of SDXC UHS-I U3 memory cards enables professional photographers and enthusiasts to capture every fantastic moment with the utmost precision. 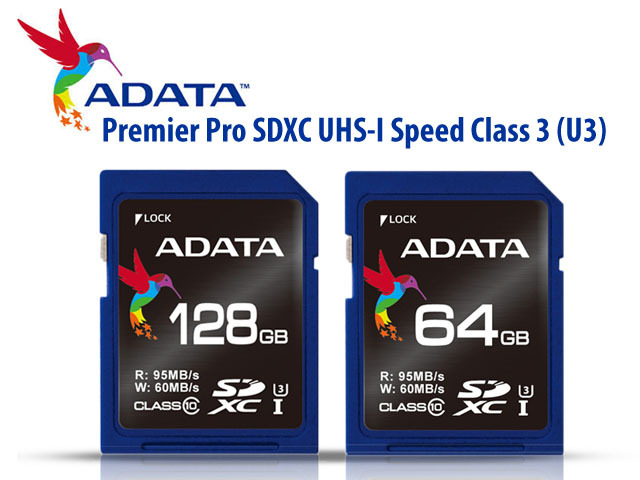 The Next Professional Grade Specification - ADATA's latest Premier Pro SDXC UHS-I U3 grade memory cards are suitable for high efficiency D-SLR, D-SLM, and 4K digital cameras, and enable professional photographers and enthusiasts to enjoy capturing vivid images to their heart's content. 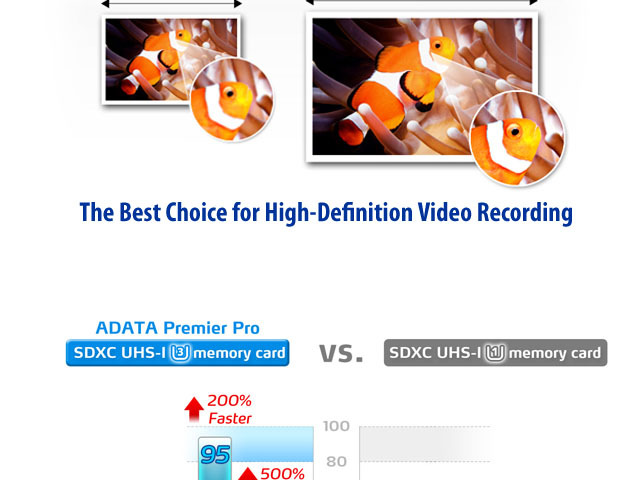 The Best Choice for High-Definition Video Recording - The SDXC UHS-I U3's high speed rating specifications support high definition Full HD and 3D modes ,and make it ideal for 4K high resolution Ultra HD video recording, enabling every remarkable memory to be smoothly captured without lag or degradation of performance. 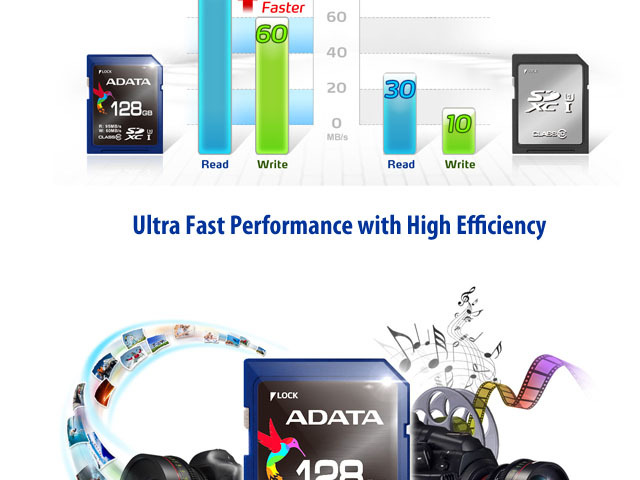 Ultra Fast Performance with High Efficiency - Premier Pro's ultra fast read/write speeds of 95/60MB per second minimize delays to ensure video recording integrity, and the series also fully supports burst shooting, reducing downtime, speeding up the video editing process, and delivering faster file transfer speeds. 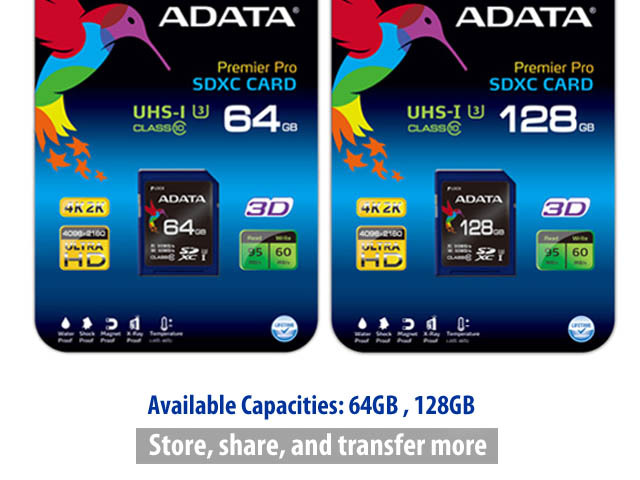 Large Storage Capacity - With up to 128GB in capacity, SDXC UHS-I U3 cards allow users to store thousands of photos and hours of Full HD video. 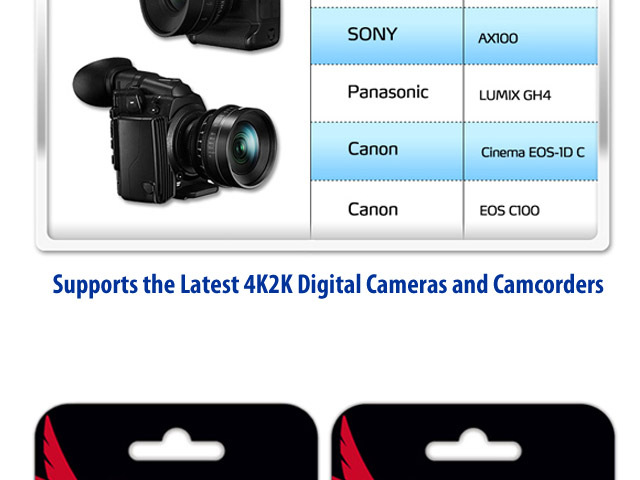 Whether working on a burst photography shoot or recording uninterrupted video, the Premier Pro series of memory cards enable you to concentrate on what matters most the task at hand without worrying about getting interrupted from running out of memory. 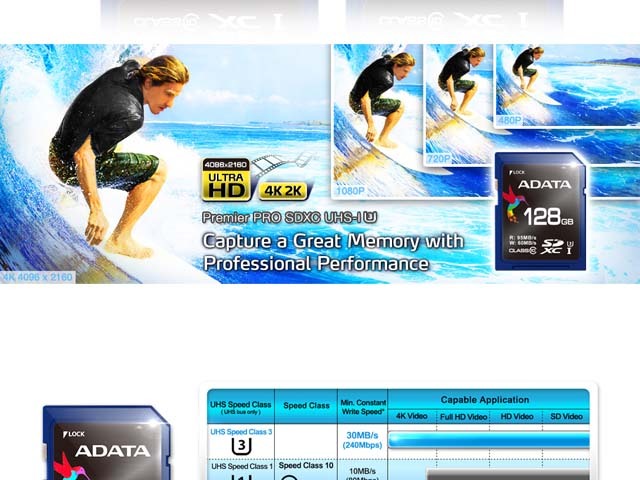 High Reliability and Long Durability - ADATA Premier Pro SDXC UHS-I U3 cards are equipped with built-in write-protect switch and automatic error correcting code (ECC) functionality and have passed extreme cold, high temperature, and X-ray stress-testing. 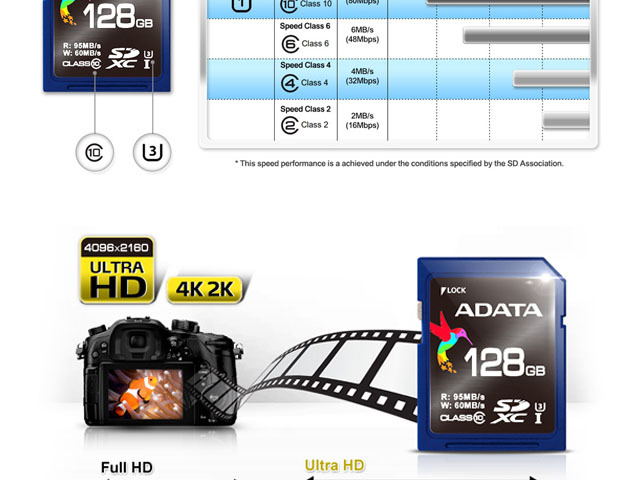 In terms of data protection, Premier Pro cards provide long-term reliability and prevent accidental data loss, allowing professional photographers and enthusiasts to concentrate on the task at hand with confidence, knowing that ADATA always has their back.